The following review originally appeared in the November 2014 issue of The Spectrum Monitor magazine. 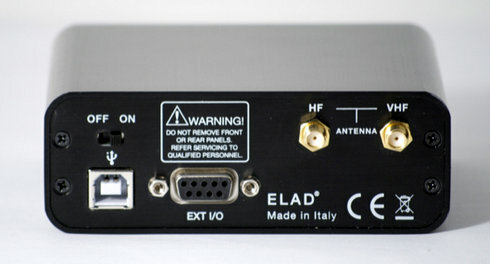 At the Dayton Hamvention this year, I made it a special point to check out the Italian radio manufacturer, Elad. Although I’ve known about Elad and their products for some time, and often found them intriguing, I hadn’t yet investigated Elad’s offerings simply because I was under the impression they sold and warrantied their equipment only within Europe. Indeed, this was the case…until just recently. Elad has now begun shipping–and supporting–their products within the US, via their division Elad-USA. Thus my renewed interest in Elad at the Hamvention. At their Hamvention booth in the East Hall of Hara Arena, the Elad staff gave me a superb table-tour of their array of products. 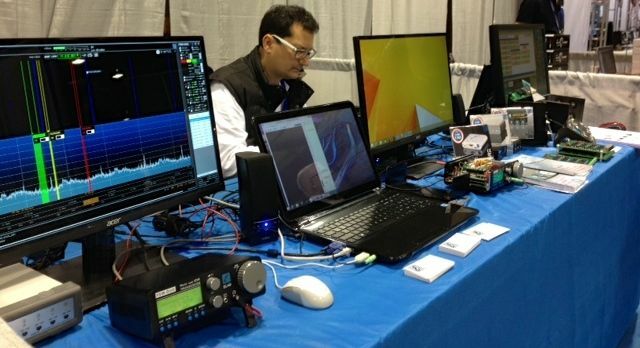 Indeed, I was completely unaware of the broad scope of Elad’s product offerings, which include antenna switches, antenna splitters, test equipment, and, of course, software defined radios (SDRs). 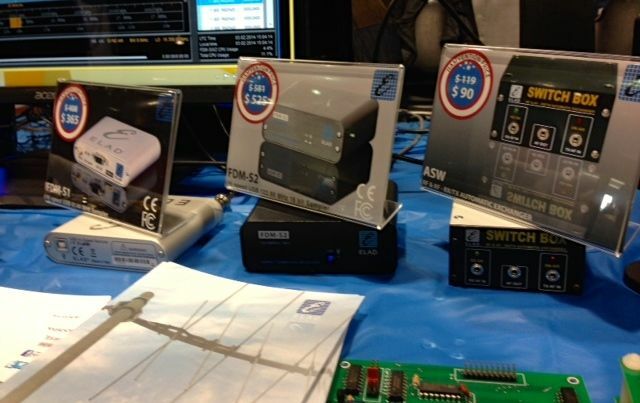 Their current SDR offerings are as follows: the Elad FDM-S1, the FDM-S2, and the newly released FDM-DUO. The FDM-DUO is actually a transceiver, while the “S” line is receive-only. Among Elad’s SDRs, I found myself most interested in the FDM-S2 receiver; a quick demo at their booth caught my interest, as I instantly liked the GUI (graphical user interface), the features, and the specifications of this model. I requested that Elad provide the loan of this SDR for review, and they kindly complied. 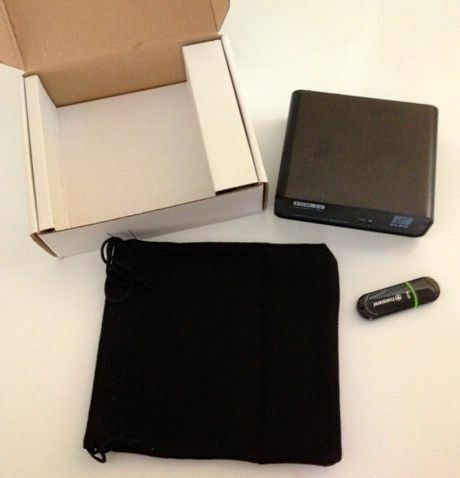 Contents of the FDM-S2 box are few and simple: the FDM-S2 receiver, a black cloth carrying bag, and a 4GB USB drive with installation software and documentation are enclosed. A standard USB cable was also included in the shipping box. First, you install a C++ package on your Windows PC. When complete, this triggers the actual Elad software installation, a two-part installation that you initiate only once. Secondly, you install the USB driver for the FDM-S2, found in the installation folder of the supplied software. Note: at present, the USB driver cannot be automatically discovered and installed by your PC–you must initiate this installation via the device manager. However, this is very easy: the guide takes you through the process step-by-step. On the back of the FDM-S2 you’ll find an HF and VHF SMA antenna ports, a USB port, serial interface, and on/off switch. The FDM-S2 derives its power from the same USB cable that is used for data; no separate external power supply is required–a huge plus, for those of us who like to travel. Once I installed the software and driver, I hooked up my antenna to the HF SMA connector on the back, turned on the FDM-S2, and launched the application. The FDM-S2 clicked to life, and the application ran on the first go–very nice! Reviewing an SDR is challenging, especially with a third-generation SDR like the FDM-S2. There are nearly an infinite number of setting combinations for gain control, filters, demodulation, audio, even color schemes; covering all of these is beyond the scope of a basic review such as this, or indeed, virtually any review. In addition, the FDM-S2 can be used with several third-party SDR applications. Therefore, for the sake of this review, I decided to limit myself to evaluating the Elad application that ships with the FDM-S2. In addition, in this evaluation I attempted to retain many of the settings that come as defaults in the Elad application, to support new users. Finally, I limited myself to evaluating the shortwave bands. After installing the Elad application, I spent a good hour or so familiarizing myself with the software. It’s quite a departure from the WinRadio Excalibur, SDR-IQ, and Microtelecom Perseus applications with which I’m most familiar. There is a modest learning curve involved with using the Elad FDM-S2–it took a good hour with the application to feel relatively comfortable with its functionality. But the trade-off is much more customization and functionality than one can achieve with the Perseus or WinRadio software, for example. First, let me begin by saying that new users will greatly benefit from reading the owners manual and join the Elad Yahoo group. If you’re attempting something that the owner’s manual does not cover, most likely someone in the Elad forum has already posted the answer. Elad’s engineer, Franco, also actively monitors and responds to requests on the Yahoo group. Once on, the FDM-S2 defaults to the frequency of 0 Hz. Indeed, the Elad software uses Hz as the unit of measure for frequency, so any frequency entered must be in Hz: for example, to enter 9,420 kHz, you must key in 9420000, then press “Enter.” As a shortcut, you can enter 9420 and the “+” key on your number pad which will automatically add the trailing “000.” I found that a bit unusual in the beginning as most SDR software defaults to kHz, but after using the FDM-S2 for a few minutes, it became second nature. I find it easiest to tune by using the horizontal tuning bars to move to a particular meter band, then locking the center frequency and use the scroll wheel on the mouse to scan in 1 or 5 kHz increments. This makes tuning feel like the experience I’m most used to with other SDRs. I must say that I really like the horizontal tuning bars; these make it quite easy to quickly center on a meter band. I would also note that I’m favorably impressed with the S2’s waterfall and spectrum display; not only can you customize the colors via the settings window, but you also have the options to embed timecode in the waterfall and to display broadcaster information from the frequency database in the spectrum. The FDM-S2 has a total of four “virtual receivers,” labeled RX1, RX2, RX3 and RX4. Depending on the receiver configuration and bandwidth you’ve chosen in the S2’s device configuration (see below), you can use each virtual receiver simultaneously. Each receiver can have its own filter settings and modes selected–your only limitation is that each of the four receivers must be tuned within the FDM-S2’s bandwidth. 2 Channels 384 kHz bandwidth. If you set the S2 to a total bandwidth of 192 kHz in one channel, all four of your virtual receivers are limited to that 192 kHz area. This is a great configuration if you plan to listen to a single broadcaster at a time, and don’t need to see so many signals within the spectrum display. It’s also an excellent configuration to save storage space if you wish to record a relatively small chunk of IF spectrum. The two-channel 384 kHz option is also a powerful and unique feature of the S2. With this configuration selected, you can have two completely independent receivers with 384 kHz of bandwidth, each. Though this may be more radio than you need, each receiver has four virtual receivers of its own. That’s a whopping 8 virtual receivers! Most of the time, I keep the configuration set to 1,536 kHz, unless I want to listen in two different meter bands at once. At 1,536 kHz, I can record spectrum and capture a full broadcast band to play back later. I’ve even recorded 6,144 kHz of spectrum, and played it back with no hiccups on my Intel i5 PC, although it did chew through a lot of storage space (roughly 2 GB of data per minute of recording). That equates to 120 GB per hour–but the result is a recording of everything between, say, 4 and 10 MHz. For shortwave radio archiving this is a most impressive capability! While Digital Radio Mondiale (DRM) is not the most popular mode on the shortwave broadcast bands, DRM is built into the FDM-S2; there is no need to purchase a separate license or plugin as with most SDRs. If you’ve never listened to DRM, you might be surprised by the impressive listening results. Within the first few days of using the FDM-S2, I was simply blown away by the DRM signal lock I achieved with Radio New Zealand International. Indeed, I’ve found that the FDM-S2 provides the most stable DRM decoding locks of any other receiver I’ve tested to date. Note that only the first virtual receiver, “RX1,” employs the DRM mode. This is important to note, as I find I’ve sometimes finished listening to a DRM broadcast, turned off the FDM-S2, then when I turned it back on later, initially wondered why I was hearing no audio on strong AM signals. I had inadvertently left the DRM mode engaged–user error only, in this case. Just something to be aware of. But finding a DRM broadcast is very easy with the Elad software; there is a dedicated button that appears when the DRM mode has been selected. When you press the schedule button, it will load all of the DRM broadcasts from the HFCC schedule. You can simply scroll through this list and click on a frequency to find an audible DRM broadcast. So far, on the FDM-S2, I’ve decoded RNZI, Radio Exterior de Espana, and even All India Radio from my QTH in eastern North America. Not bad! One of the reasons I latched onto the FDM-S2 at the Dayton Hamvention this year was that I immediately saw the potential of the S2 as a recording receiver. Besides posting recordings on the SWLing Post, I also actively make recordings for the Shortwave Radio Audio Archive, so no surprise that one of the first functions I evaluated on the FDM-S2 was its recording capability. There are two recording modes: AF and Full Span Input Spectrum. You switch between modes in the Recording tab of the Settings window. After the settings have been saved, you simply locate the broadcast or chunk of HF spectrum you wish to record, and press the red record button located on the screen’s bottom left quadrant. The Elad application also gives you a great degree of control for automatically naming the recorded files; mine is currently set up to embed the frequency, date, time, and device in the filename. I do wish that it wasn’t necessary to open the settings window to switch between bandwidth configurations and recording modes (IF or AF); my Excalibur has all of this on the front panel, which is more convenient. While there is a more direct way of opening the recording settings window–simply right click on the red record button–I think it would be preferable to at least have the option of including the information on the main user interface. Also, when you stop a recording, the receiver turns itself off; this obviously needs to be corrected. Fortunately Elad has noted these concerns and plans to address them in future software updates. Additionally, I’ve noted that while one can record either IF or AF, both can’t be recorded at the same time, a lacking shared, incidentally, by the Microtelecom Perseus. While I probably do more recording than most SWLs, I frequently record both spectrum and an individual broadcast simultaneously on the WinRadio Excalibur. I hope Elad will consider adding this to their software, as well. Features are always nice to play with, and the FDM-S2 is chock-full of them–but most important are your receiver’s ability to detect faint signals, block adjacent ones, as well as cope with unpredictable conditions. The FDM-S2 has a wide frequency coverage: 9 kHz-52 MHz, 74-108 MHz, and 135-160MHz. It’s one of the few SDRs on the market that doesn’t need a module or add-on for FM and VHF coverage. It has separate SMA connectors for HF and VHF antennas. While I have not thoroughly tested beyond the HF bands as of this writing, but many experienced FM DXers tout the S2’s abilities in their own reviews, and I don’t doubt them. On the shortwave bands, the S2’s performance has impressed me: this SDR has remarkably excellent sensitivity and selectivity. Indeed, its performance is on par with my WinRadio Excalibur, and surpasses that of my RFSpace SDR-IQ, no mean feat. I have made many A/B comparisons with my Excalibur on weak signals; the two receivers are nearly indistinguishable. I’ve conducted blind-listening tests on weak signals (much like those described here) and found that the two recordings were nearly identical. On occasion, I might favor one receiver’s AGC over the other in a recording, but a slight tweak to the AGC settings could readily fix any discrepancies. Herein lies the difficulty of reviewing an SDR’s performance–the user has so much power to control variables and thus shape the receiver’s function, that it’s hard to make an “apples-to-apples” comparison. But clearly, the Elad holds its own. While I’m not a great fan of digital noise reduction, the Elad software has a variable noise reduction feature that I admit to have used on several occasions. I found that by increasing it to approximately 10-20%, audio characteristics of an AM signal were mostly preserved while noise was effectively mitigated. This is where the S2 has a distinct advantage over the Excalibur which has no noise reduction feature. With that said, the Excalibur has an edge on the S2 when it comes to blocking adjacent signals. At the time of review, I’m using version 1.12 of the Elad software, which lacks a selectable AM sync detector–a powerful tool to block noise, which may only be present in one sideband of an AM broadcast. Elad engineering tells me that they have this feature planned for a future software update. Remarkably enough, the FDM-S2 can actually be used with a number of third-party SDR applications. The FDM-S2 comes with Winrad EXTIO Dlls compatible format: all software based on Winrad derivatives (like HDSDR and Studio1) work, and have been tested by S2 users. So if I really need sync detection, for example, I can simply find and use another SDR application to run the S2. Indeed, flexibility may be among the most powerful features of the S2. If for any reason you don’t like the Elad application, you can simply use another one. 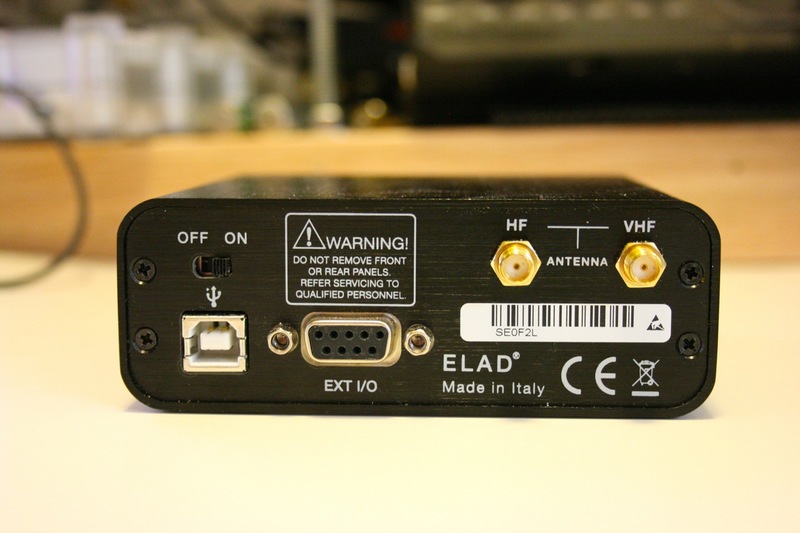 While the Elad FDM-S2 has some growing to do, I expect many of these concerns may be addressed in updates over time, and I look forward to trying the S2 with other SDR applications. I’m fairly confident that Elad is serious about their products’ iterative agility, which is to say, software development based on customer input. They’ve been responsive to email and active on the Elad Yahoo email discussion group, which indicates promise. I believe they’re serious about supporting the North American market as well as they even attended the 2014 Dayton Hamvention. Frankly, at $580 US (via Elad USA) I think the FDM-S2 is quite reasonably priced, especially considering this SDR’s performance and features. After all, it’s only $80 more than the RFSpace SDR-IQ, while it is $300-400 less than the Microtelecom Perseus and WinRadio Excalibur. That’s good value, in my book. For the Elad FDM-S2, the answer is, unhesitatingly, Yes! I intend to purchase the FDM-S2 from Elad immediately following the publication of this review. I believe it will make a fine addition to the shack–I can see myself using it often for travel, future DXpeditions, and, of course, shortwave radio archiving. 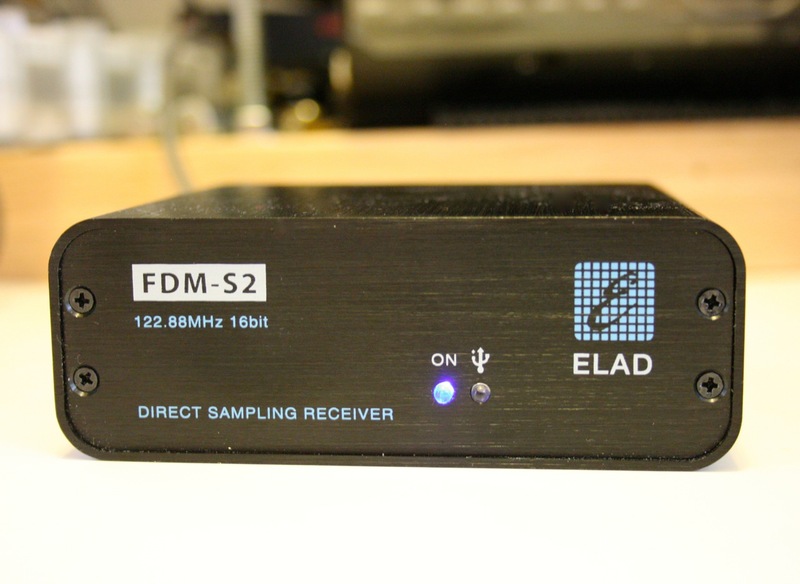 As always, the proof is in the pudding: look for my Elad FDM-S2’s coming contributions to the Shortwave Radio Audio Archive in the near future. And listen for yourself. This entry was posted in DRM, New Products, News, Radios, Reviews, Shortwave Radio, Shortwave Radio Reviews, Software Defined Radio and tagged ELAD, Elad FDM-S2, Elad FDM-S2 Review, FDM-s2, SDR, Software Defines Radios on December 2, 2014 by Thomas. 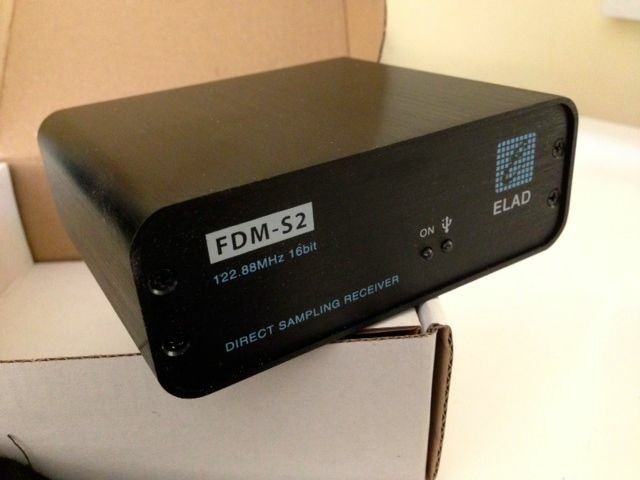 WELL Elad FDM-S3 announced – -> fabulous and I guess it means continued development of the FDMSW2 software. Hopefully Brexit wont affect the price too much at this stage. Now ,I was thinking about going to Italy on a holiday later this year……..
Hi, good review but a mistake in there. The DB9 on the back is NOT a serial interface. Check the documentation if you don’t believe me. No mention how to actually operate the unit. I have powered it up a few times and somehow I have 4 receivers running at once and the audio is quite “chattery” and pixelated and I do not know how to shut it off or use it as 1 radio only. Would have liked to try recording some spectrum overnight – but again, no user guides or instructions how to use it. and I don’t need an actual computer running beside it, I am not sure I am going to become a quick convert. It’s sort of buried in the Elad website. 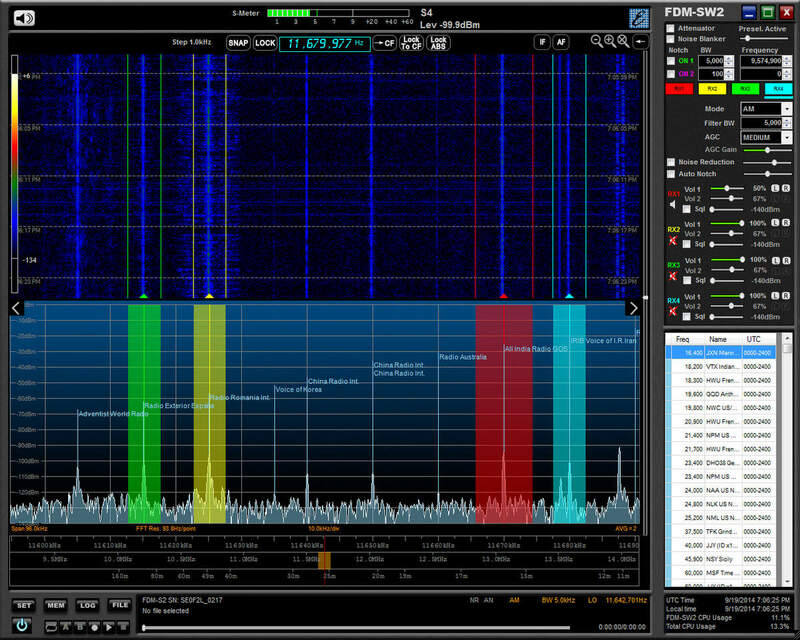 The software takes a little patience–especially as a new SDR user. There’s a bit of a learning curve, but much smaller than open source options. It’s a fantastic SDR. I currently have one on load from deer Dr. Walter Salmaniw — and I have been hesitant about SDR’s for years – even though I have used quite a few. My Drake (the anchor in my shack) is getting on in years and although I can keep replacing minor things as they fail, there will come a time when a new anchor takes its place. It could be this one. I am very interested! Quick question, is this radio capable of decoding PSK, RTTY, CW? I just recently begun reading about SDR’s in general and am overwhelmed by the technical terms. Can’t seem to find anything anywhere that says if I can use the S2 to receive and decode this type of signals. It is a great SDR. And thanks to this great review, I have a question. First the assumption. From reading this & other reviews it seems …. ELAD-PERSEUS-WinRad & perhaps other newer/better SDR’s have similar RF-AF characteristics in terms of sensitivity, selectivity, AGC, dynamic range, the ability demodulate analog (AM-SSB-CW-FM) signals with similar excellent sonic qualities – low distortion, wide AM audio freq. response with notching at 5khz & 10khz, narrow SSB or CW response with no ringing, etc. If all that is true, then …. How do any of the newer/better SDR’s stack up against the ‘better old-school HF radios’ for same qualities? How do these SDR’s compare to classic radios like the JRC’s, the Drakes, the AOR’s, Lowes, Grundigs, Icoms, Sony’s, etc. for the ‘RF radio receiver qualities’ we have come to expect, appreciate & enjoy? Does anyone know of any A-B comparisons between say an AOR 7030 or a Drake R8B and an ELAD or a Perseus pulling a weak one sandwiched between two adjacents at 5khz each? Hi Thomas, a number of the FDM-S2 shortcomings can be overcome by using alternative software. For instance, I’m a fan of HDSDR over the Elad SW2 software. I like the slider approach to zooming the spectrum display, and HDSDR has Synch-AM Selectable Sideband which the Elad software does not. I also find the changing of filter bandwidths to be tedious in the Elad program, but with HDSDR you can click and drag the filter envelope to shape the filter, similar to the way the Perseus software operates. I also like Simon Brown’s SDR-Console V2 software for use with the FDM-S2. It’s extremely professional in its approach, and I’m eagerly awaiting the upcoming addition of a full-featured scheduler/timer module for WAV (I/Q) recordings. This exists in the earlier V1.5 version of Simon’s program, but is still being finalized for V2. Hopefully it will appear this month. 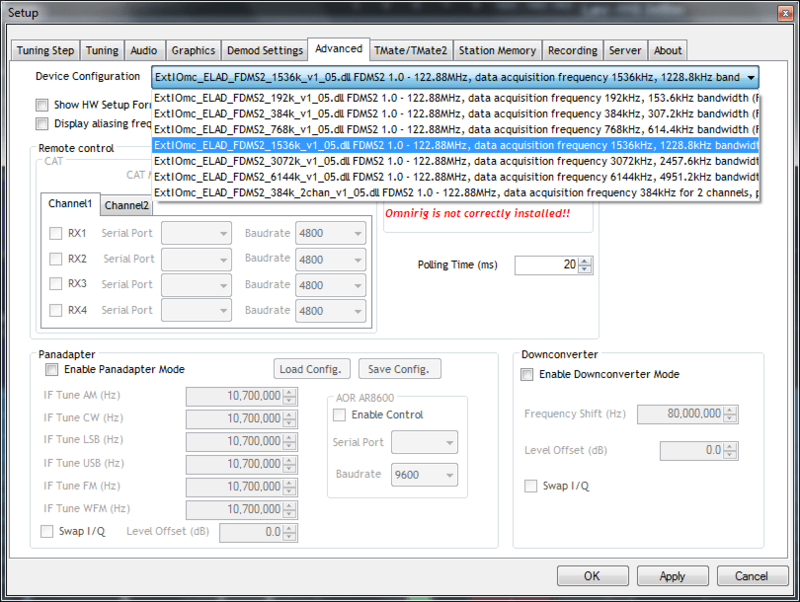 Another post on your blog discussed high pass and low pass filtering for the FDM-S2. For LW & MW DXing, I use a Mini-Circuits BLP-1.9+ low pass filter, that greatly attenuates signals above 1.9 MHz. It’s very compact with BNC connectors, and was just $20 on Ebay. A high pass (BCB) filter I plan to use when I’m DXing shortwave is the reasonably priced kit from an Australian company, http://www.minikits.com.au. They sell a 9th-order high pass filter, and in kit version it is only ~$17.00 USD, with all parts except enclosure. So, I bought the kit and the owner of the shop shipped it right away (Intl. airmail for $8.00). I’ve bought the proper Hammond brand case for about $5.00 through the Mouser Electronics web site. I checked the response plot for the filter and it looks really good: http://www.minikits.com.au/eme174filters.htm#hpf9-1m8. Now I just need to heat up the soldering iron and build this kit! As you probably know, BCB filters often run upwards of $80, ready built from most sources like Kiwa. Enjoyed the review. Just curious, what was the time and frequency of the RNZI DRM broadcast. Sounds wonderful! Hi, George: I believe I copied that on 9890 kHz this summer. Thanks for the review. Do you know if the FDM-S2 would work with Mac OS? 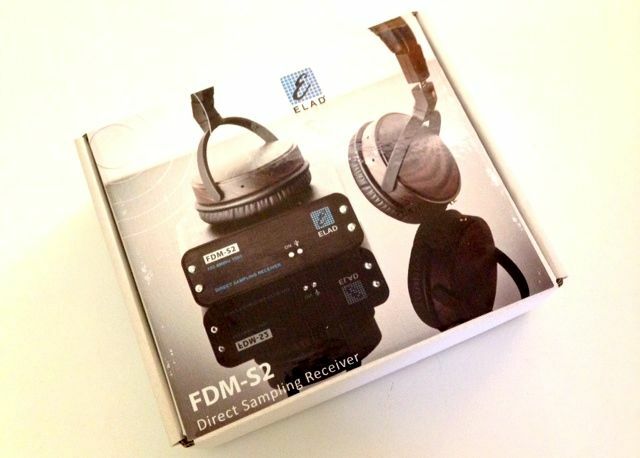 Even before reading your great review the FDM-S2 was top of my “Buy myself a Christmas gift” list. 🙂 Your review just made the purchase much easier.